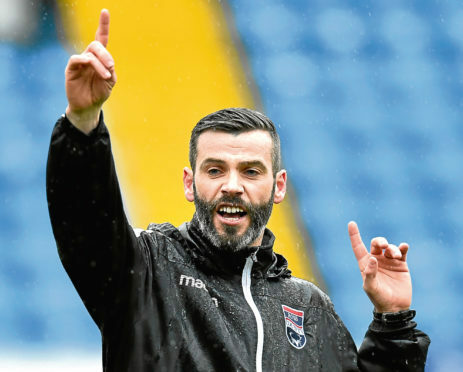 Ross County co-manager Stuart Kettlewell says the Staggies are prepared to accept the consequence of a busy fixtures schedule if they progress to the latter stages of the IRN-BRU Cup. County take on Montrose in the last-16 of the competition tomorrow, with the Dingwall men strong favourites to secure a quarter-final place at the expense of the League 1 side. Should County go all the way in the competition, the respective dates for their last-eight, semi-final and final ties would all clash with Championship home fixtures, which could cause a fixtures pile-up later in the season. Kettlewell says it is a price worth paying in pursuit of silverware, and he said: “That’s the hand you are dealt if you go on a run in this cup – which we want to do. “It’s the same as we did in the League Cup, and the same as we will want to do once the Scottish Cup starts up. “I look at the English football at lower league level, and it’s Saturday to Tuesday for large parts of the season. “It’s the job of Steven Ferguson and I to strike the balance between training and playing games, but if you ask any professional player what he would rather do, he would say play instead of train. County had hoped to have skipper Marcus Fraser back in the frame for this weekend’s tie following a shin injury, however Kettlewell confirmed the defender will not feature, adding: “Marcus is still going to be short for Saturday. “We are hoping to get him back out on to the training pitch and try and increase what he’s doing. He has been to see the specialist again, but it’s been a funny one for somebody like Marcus who is normally able to just roll up the sleeves and get on with things. “It has just been a little bit more complex than what we first thought. Hopefully this is him into a position where he can get out on to the pitch and kick on from now. Kettlewell says the performances of former St Johnstone and Dundee United defender Keith Watson have gone a long way towards compensating for Fraser’s absence, adding: “Keith has been excellent. When we signed Keith we knew that’s what we were going to get, somebody with real versatility. “He has played well since he has gone into that right back slot. He’s very comfortable playing at centre back, which he would probably argue would be his preferred position.